Having the front chop done-ish, it was time to move onto the rear chop. 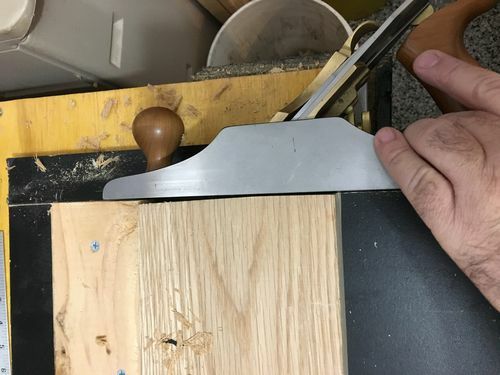 It was less tapered than the front one, so just a few swipes of the plane took off the 3/32” or so that was needed to get it square along the long sides. 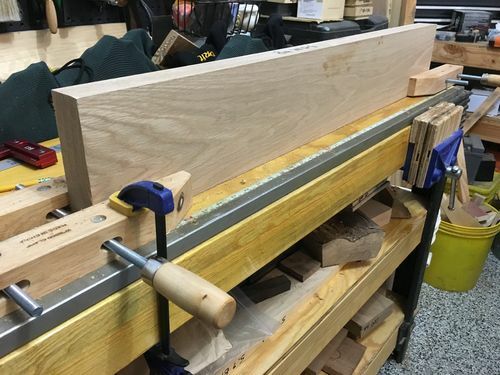 But the ends were more angled, and since I wasn’t rounding them off like I’d done with the front chop, I wanted to get them nice and square, so out comes the shooting board. Once everything was square all around, I used a spokeshave to break the edges just a little. Two passes down each corner was plenty. With that done, it’s time for the oil. 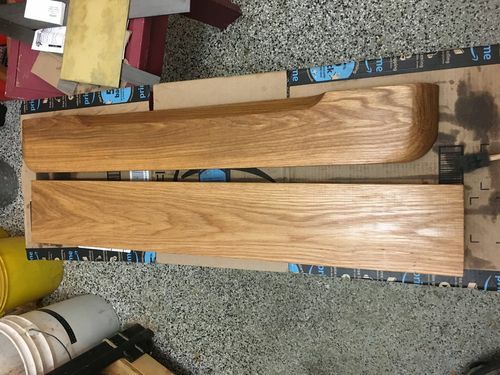 I want a coat on the side of the wood that will be facing the bench. The side that will be the jaw of the vise will get some crubber on it, so I’ll worry about that later. And since the oil is out, time for a third coat on the front jaw. Now for the thinking. 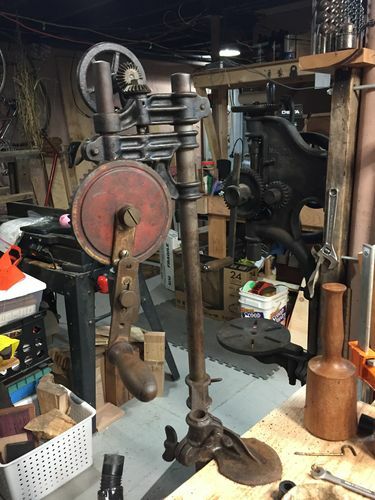 I need to drill 1.5” holes into the jaws and the apron of the bench to mount the vise. I have a spade bit that large, but that’s almost impossible to get a straight hole with using a brace. Homer Depot near me doesn’t stock 1.5” auger bits, so I’ll need to order one if I want the right tool, but I remember from making my low bench that a modern 1.5” auger bit requires a fearsome amount of torque, and I’m not sure I want to try that. 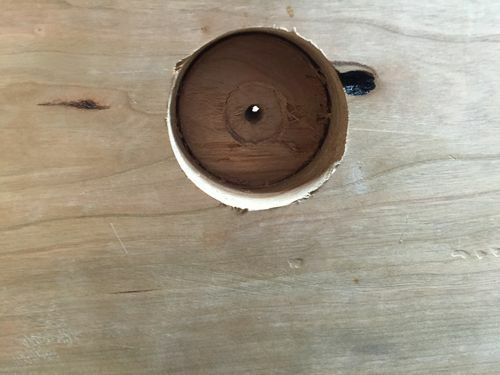 I have a 1” auger bit I could use, and then make a tapered reamer to enlarge the holes. I even have a mostly worn-out hacksaw blade that would make a good reamer blade. 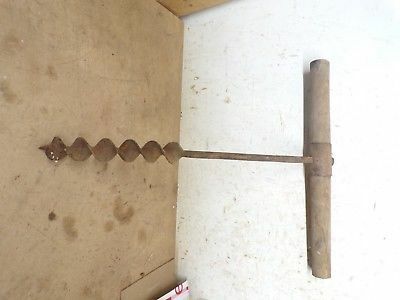 Or I could wait for the old-school T-handle auger I just bought on ebay to arrive, and then I’ll clean it up enough that it’ll work. I think I’ll bore holes either 1” or 1.25” (whatever my largest bit is) and then build a reamer, and maybe hand-file the last 1/16 or so of the holes. 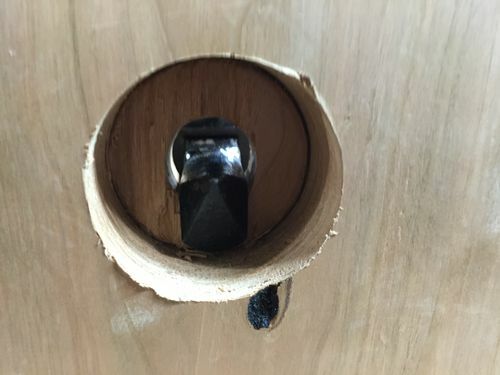 Looking at the vise hardware, it looks like there’s a little slop to play with, and I should be able to get all the holes straight with a tapered reamer and rasps. And I got the 1.5” stick of red oak cut, tapered to 1.25”, and octagonalized before I had to take a break to rest my back. Later today I’ll get it so it tapers from 1.5” down to an inch on the narrow end and is a pretty octagon. It’s pretty quick to round it from there with a spokeshave, then saw a kerf and drop in the old hacksaw blade. As long as I keep the fat end just under 1.5”, I should be able to ream out the holes and then finish them up with a rasp. The off-cut from making the scrap square should be plenty good to make a 3/4” or so cross-handle, I think. I love it when a plan comes together. Dave, wouldn’t it be easier to cut the kerf in the reamer before you round it? Nice looking chunk of oak. Might be, Duck. But it just needs to be big enough for an old hacksaw blade, so it’s not like it’s a huge amount of work. I also forgot “drill a hole for a handle” and “make a handle”. Got those done now. Kerf and rounding happen tomorrow, I think. My back has had it for the day. Edit: the handle hole is 5/8”, so if the wooden handle breaks, I can use one of my holdfasts as a handle. Not that I should need anything like that kind of torque. 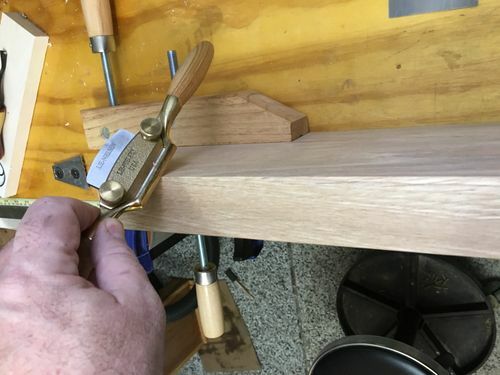 Dave, for big bores I used an expansive brace bit. Drilled a small pilot bore, smaller than the snail thread, and then went at it with a 14” brace and the bit. This bore has two different sizes and was made in the deadman to accommodate a Stanley 203 clamp. 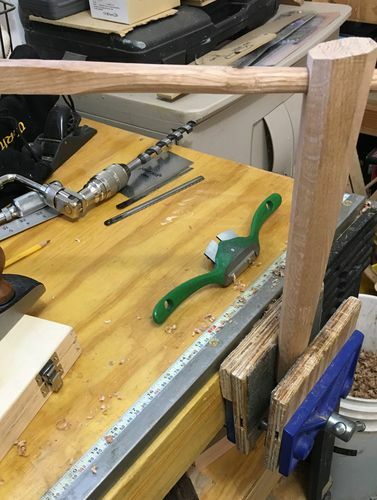 Yeah, my bit for anything bigger than an inch is an adjustable spade bit, but it’s hard to keep straight through the 6” of wood I’ll need to drill. I figure a 1” auger, followed by widening the hole with the reamer gives me a chance to correct and wandering after the fact. Or I can touch it up with a rasp if I’m just a little bit off. I was hoping to see a huge boat called Vice full of scantly clad ladies fussing over you. Sorry, Robert. I don’t think my sweetie would approve of such shenanigans, and I’m pretty fond of her. Your persistence will get you there Dave. I wish I had a better idea for you. I ordered a 1.5 inch auger off eBay that should be here by the end of the week, but then I’ll have to clean it up and sharpen it before it’ll be ready to use. 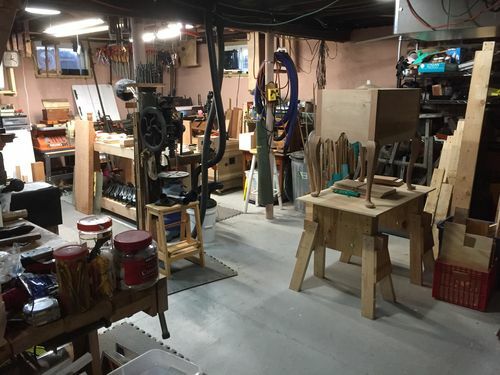 I’m hoping to get out today to at least mark where all the holes are going to need to go, but my back has been acting up, so it might be a day with no shop time. We’ll see how it goes, I guess. Plan A is still the one-inch bit, followed by a reamer to get up to the required size. Unless I find a post drill that’s ready to bolt up and use. That’s probably on the shopping list now, too. Dave, I didn’t realize you needed the expansive auger, I assumed you had one. I have several! If you need a spare PM me. I’ve got an expanding spade bit. It’s a modern Irwin one, and works about as well as a spade bit, which is to say okay if used in an electric drill at reasonable RPMs, and less good if run by a bit brace, especially at larger diameters. I’ve tried that, and my holes tend to wander a little. Probably need more practice. I’m doing more and more with hand-tools and getting that practice. The auger I bought will definitely do the job once I get it cleaned up, but it’s rusty and won’t be here until next weekend. So the reamer I’m building will do the job for this vise. And I’ve “steered” the hole with a reamer before to get things lined up correctly, so I’m confident in that approach. It just won’t be quick. Thanks for the offer, but I think I’m in good shape. Just need to get shop time to get the job done, but I’m also fighting a bad back. I don’t think I’ll get any shop time today. 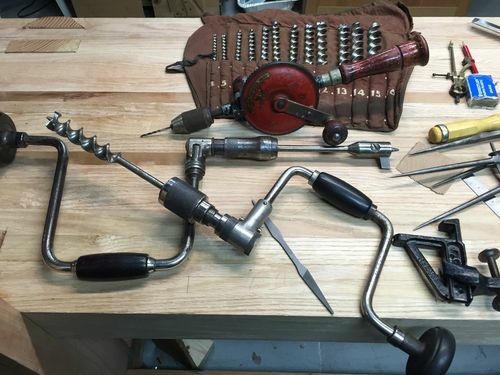 I think the long-term answer is going to be getting a post drill with decent bits, but that’ll be a project for after I’ve gotten my back fixed and my doctor has cleared me to lift heavy stuff again. Dave, I have a Canady Otto 00. Works great but it has taken time to acquire 1/2” shank bits for it. For small stuff this MF is useful.